Mattress shopping can sometimes be overwhelming, but it is very important to ensure you are choosing the best mattress for you and your sleep partner; after all, you will be spending a third of your day on it. When considering mattress options, the starting point is to determine if you want an organic mattress or a traditional mattress. To help get you started, here are the top four organic mattress myths, including one that applies to both organic and non-organic mattresses. There are organic mattresses to fit any price point, just like traditional mattresses. A traditional mattress Queen set can cost anywhere from $250 to $5,000 or more. Organic mattresses typically cost somewhere in the $1,000 to $2,000 range. However, be aware that some mattress companies hike up the cost to improve their bottom line. Also, popular brands tend to be more expensive. 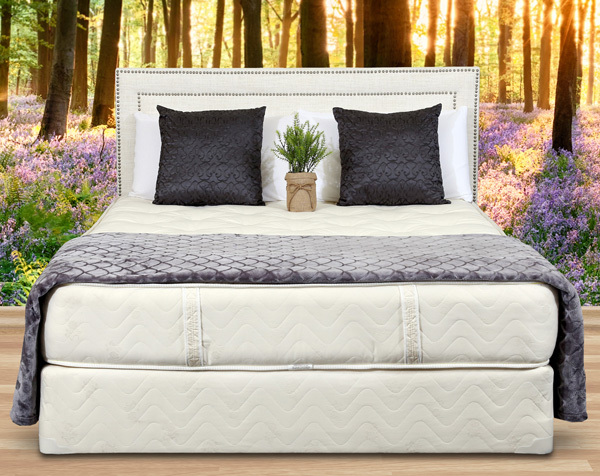 When comparing organic mattress costs to traditional mattress costs, factory direct organic mattresses could even be less expensive than the high-end traditional mattress. Some mattress companies use the term “certified organic” as a marketing tool — there really is no way firm regulation by the government regarding organic mattresses. Some global initiatives do exist but be sure to ask a lot of questions. For example, some parts of the organic mattress materials may be able to be certified, and others are not. Does that make the mattress as a whole certified organic? Not really. Research what materials are important to you and seek out an organic mattress that contains them. Be prepared to compromise and list out your must-haves. Back pain is so specific for each individual who experiences it. While some say a firm back is best for a bad back, other experts disagree. A soft organic mattress could support the body’s shape, while a medium-firm mattress can provide comfort on pressure points. A firm mattress could be supportive but cause issues on pressure points since the body can’t conform to it. When shopping for a mattress, head to your local mattress store, like Gardner Mattress, to actually test them out. Expect to test out quite a few mattresses to find the perfect fit. Contact Gardner Mattress to visit our showroom and try out our mattresses today. We’ll help you find the right fit for your specific needs.